Best Ten Minutes of War Ever. 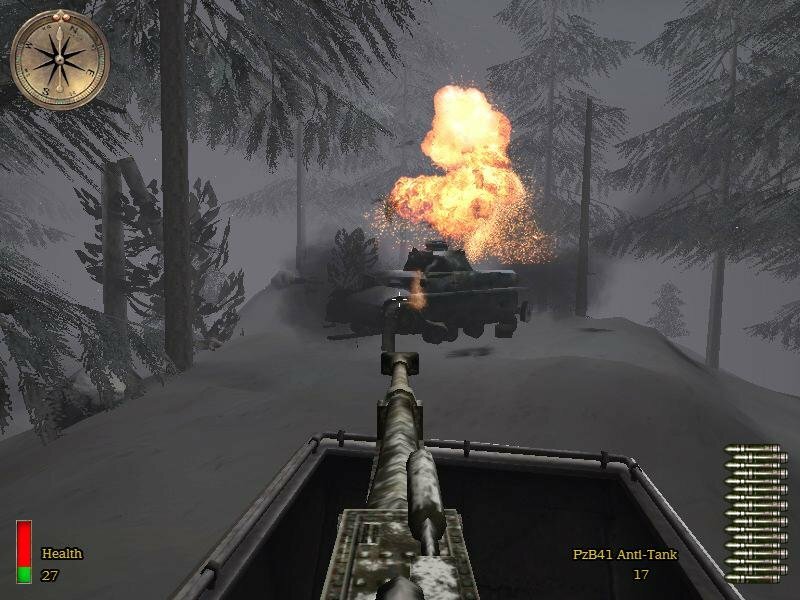 Knocking out German artillery in the Ardennes. 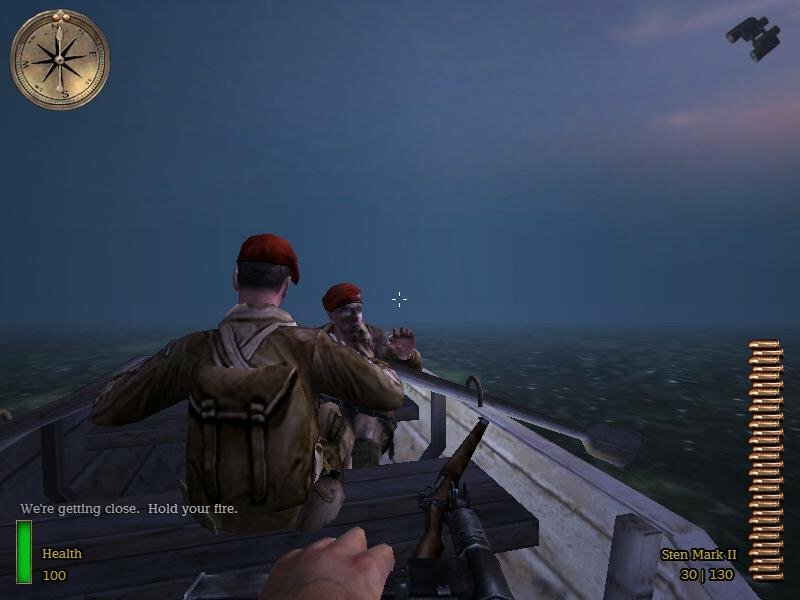 Lots of missions have that ‘Band of Brothers’ feel. 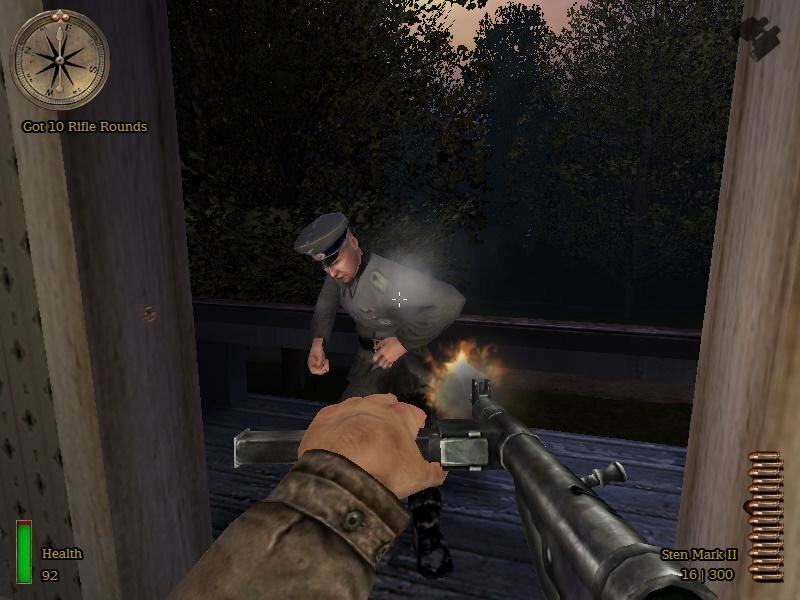 Bullets whiz by astonishingly fast in Spearhead, but so does the war itself – no sooner do you land in France that you find yourself defending the line in the Ardennes, and then you hear the Soviets have broken down the gates in Berlin. To its credit, the short ride through the Reich is sweet and frantic, but I expected something longer. 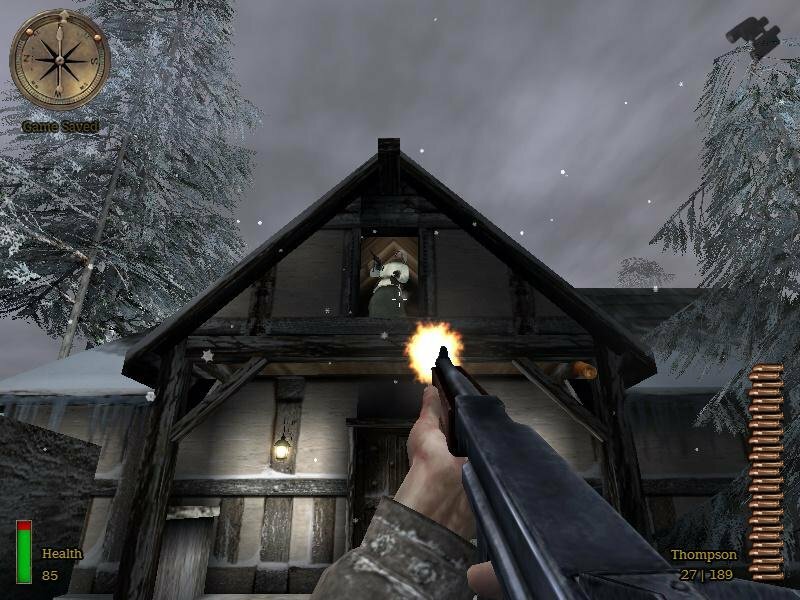 Realistically speaking, however, Spearhead’s three missions add up to about three or so hours worth of solo action – a poultry, even for an expansion pack. 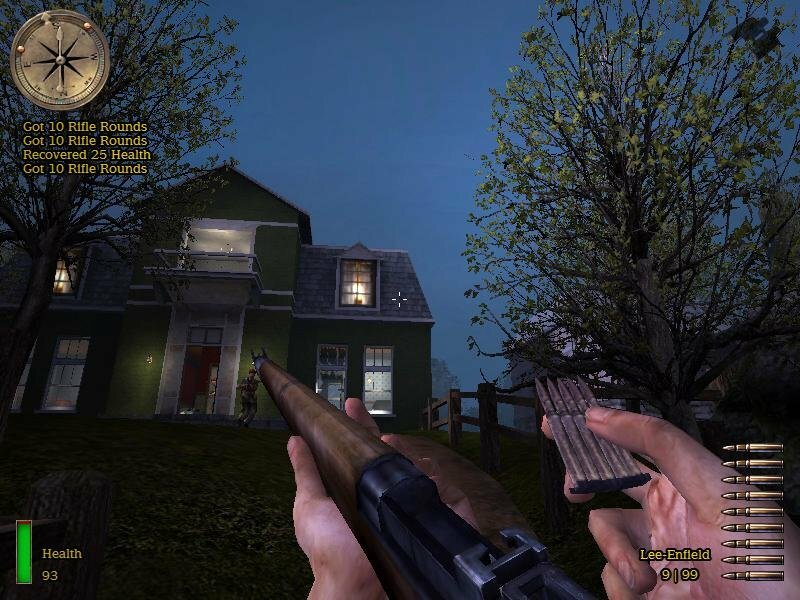 Spearhead may offer but a fleeting glimpse of the Second World War, but the expansion itself is rife with so many enhancements that it makes it all worthwhile. 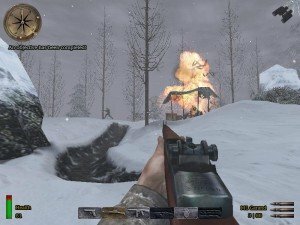 Your character, a Sergent of the 101st Airborne Division (very skillfully voiced by none other than Gary Oldman), gets parachuted into Normandy during D-Day in the face of overwhelming German fire. 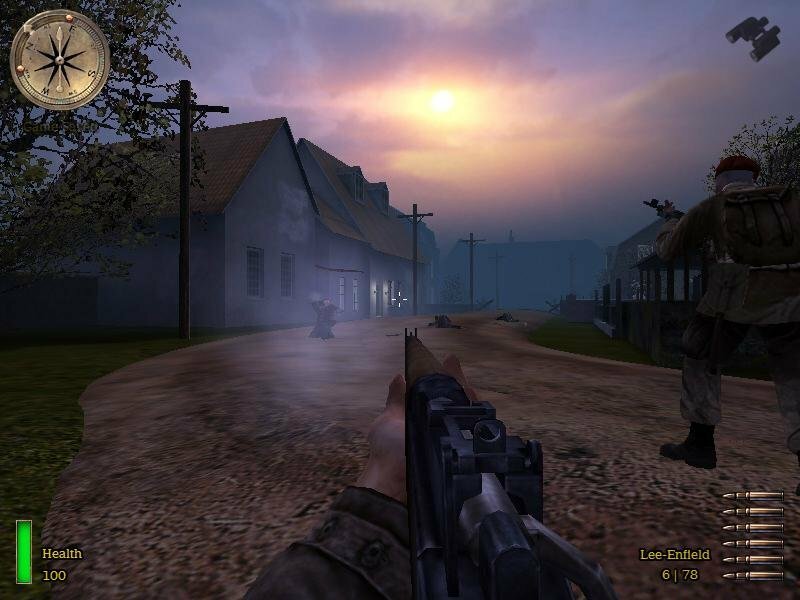 If Saving Private Ryan was Allied Assault’s staple cinematic muse, then Band of Brothers serves precisely the same function in Spearhead – many scenes from that brutal HBO mini-series can be found ingame, and seeing the show adds some nuance to the overall experience. The game starts out very strong with a scripted parachuting sequence that looks and sounds fantastic. You jump out of your doomed plane and are immediately greeted with deafening flak explosions, crashing planes and all-around chaos. 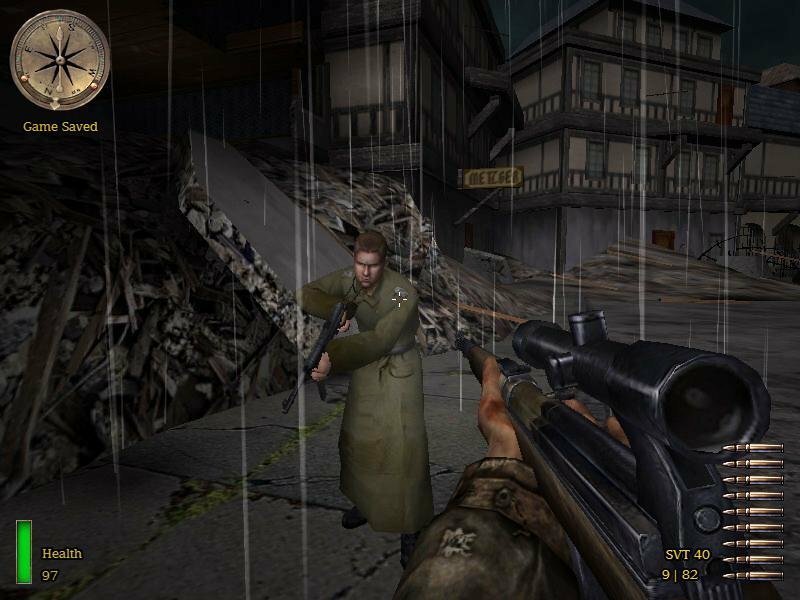 Naturally, your character gets separated from his squad but manages to hook up with a group of British SAS troops sent in to blow up a bridge, offering the perfect excuse to try Spearhead’s new armory. 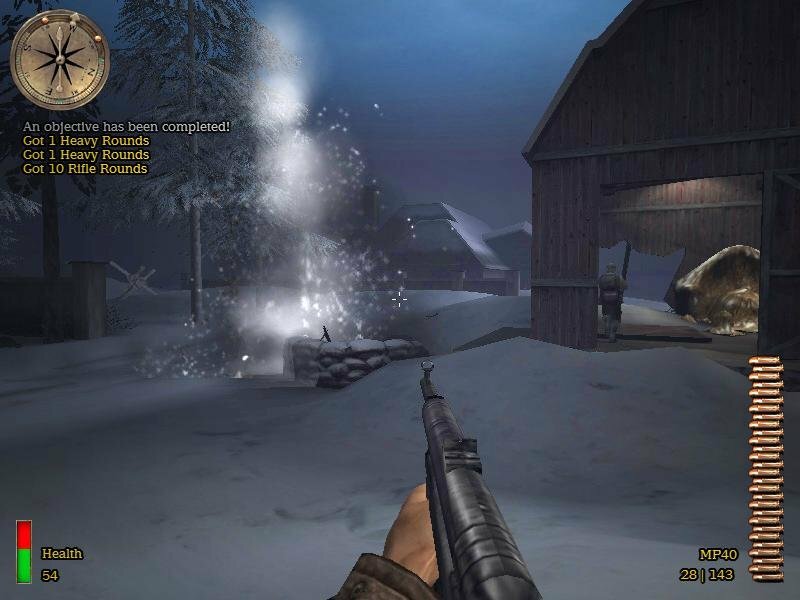 A second mission will have you take part in some heavy skirmishing in the frozen wilderness of the Bocage, and a final one takes place in Berlin itself, or what’s left of it, where you’ll have a chance to deal death with a T-34 tank. Each mission is comprised of several levels coherently stitched together, and the objectives found therein are quite diverse. 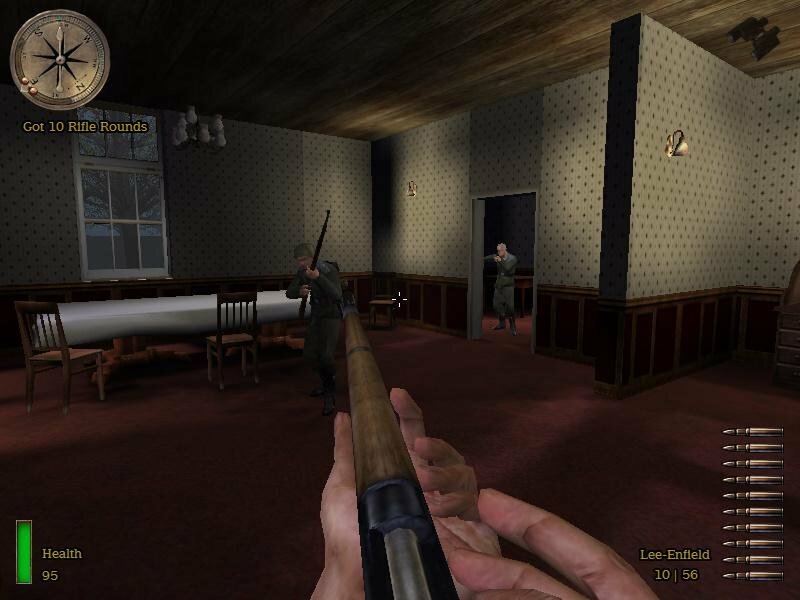 The game comes complete with a fresh arsenal of British and Soviet weaponry, all of which look and sound great, and the game now allows you to melee opponents with any equipped weapon. 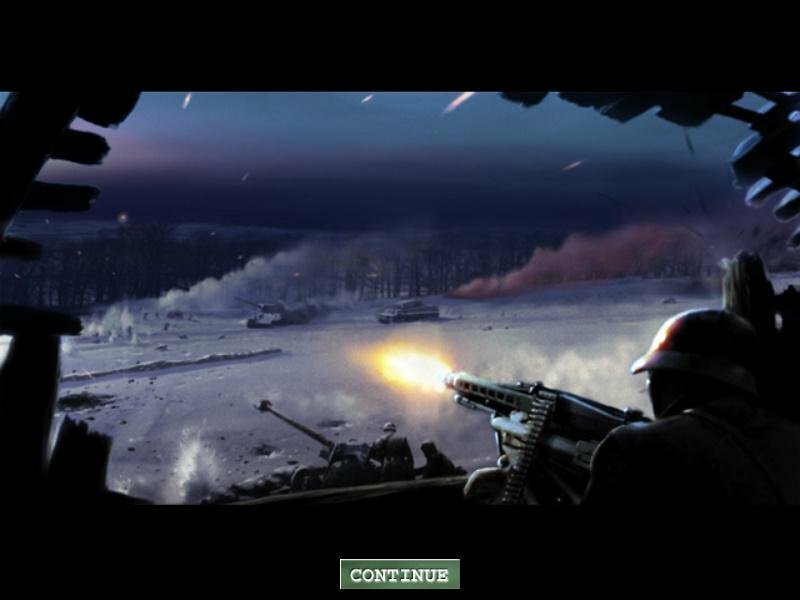 Also cool are the stationary guns which you can now use against enemy vehicles and troops, including the automatic Nebelwerfer rocket launcher or the devastating Flak 88. 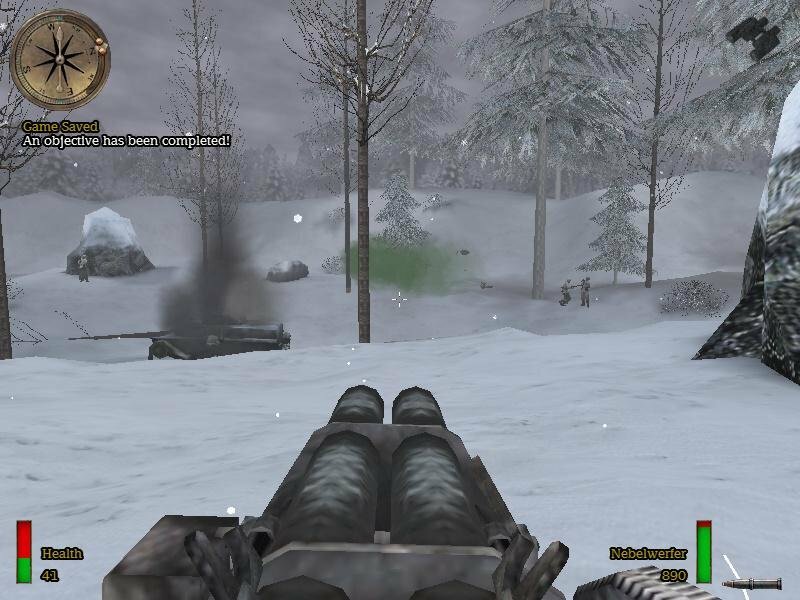 You’ll get a chance to drive the T-34 tank right before the game ends, and this aspect too is improved from the original (allowing you to switch between the cannon and a mounted .50 caliber machinegun). 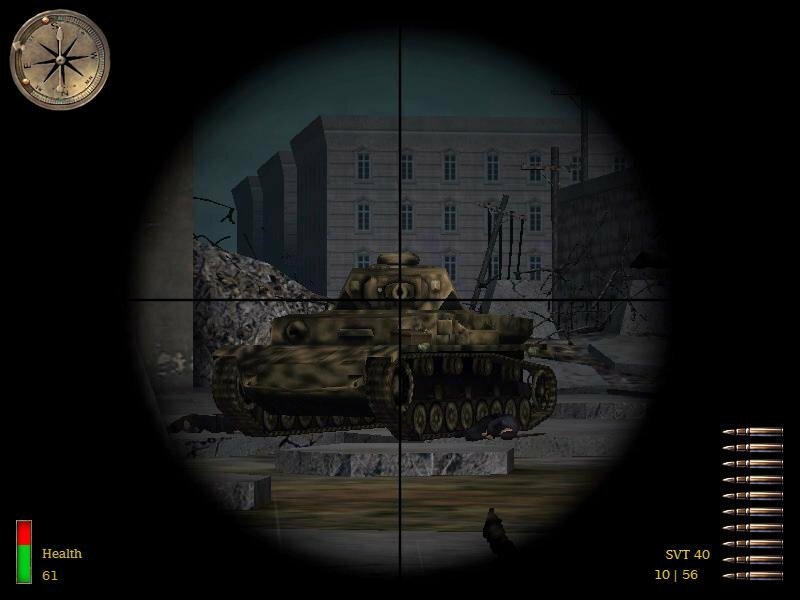 Mission scripting as a whole is more solid and the action intense, but some of the halfway missions can become quite frustrating. A chase sequence involving hightailing it with a convoy of German supply trucks in the Bocage is extremely punishing no matter what difficulty you choose, and defending the line against a subsequent German onslaught is equally tedious. 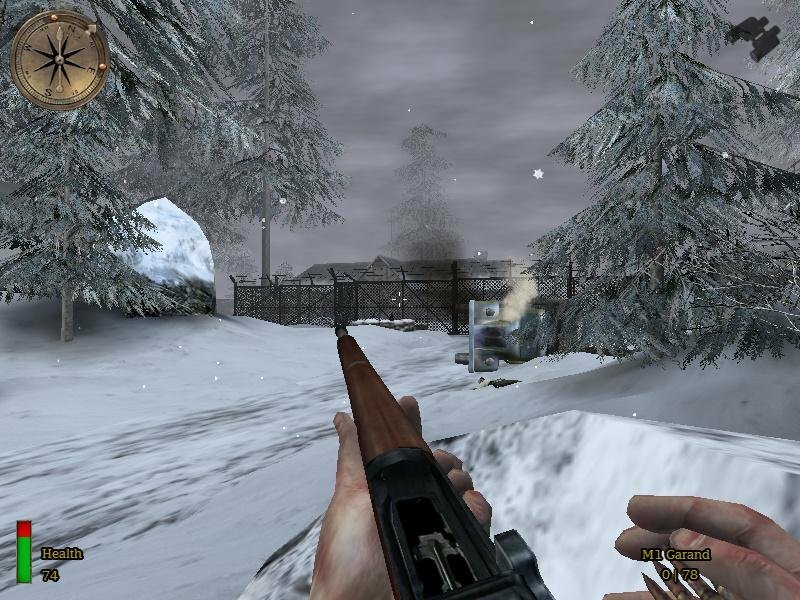 The Sten is one of several featured guns. 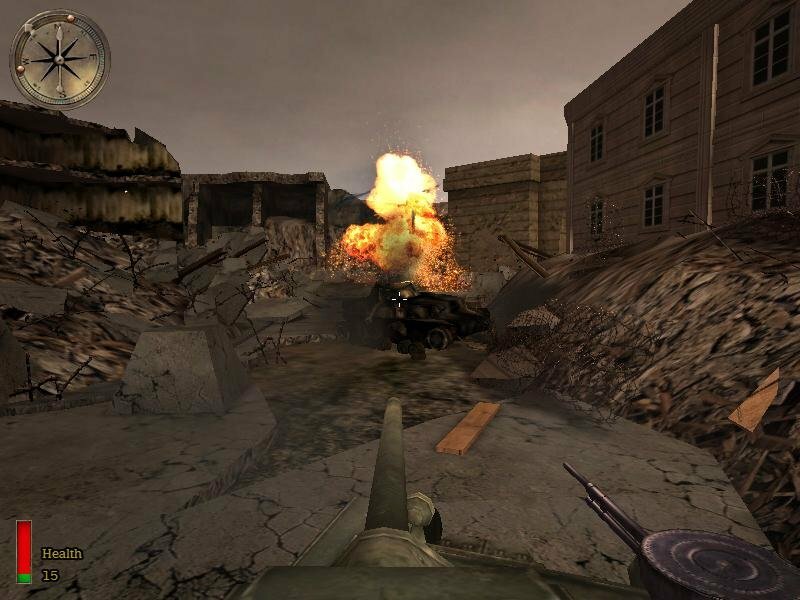 Spearhead is a more team-oriented game, as perfectly hinted at by the game’s original running title – Medal of Honor: Team Assault – to which the game also has an improved AI. 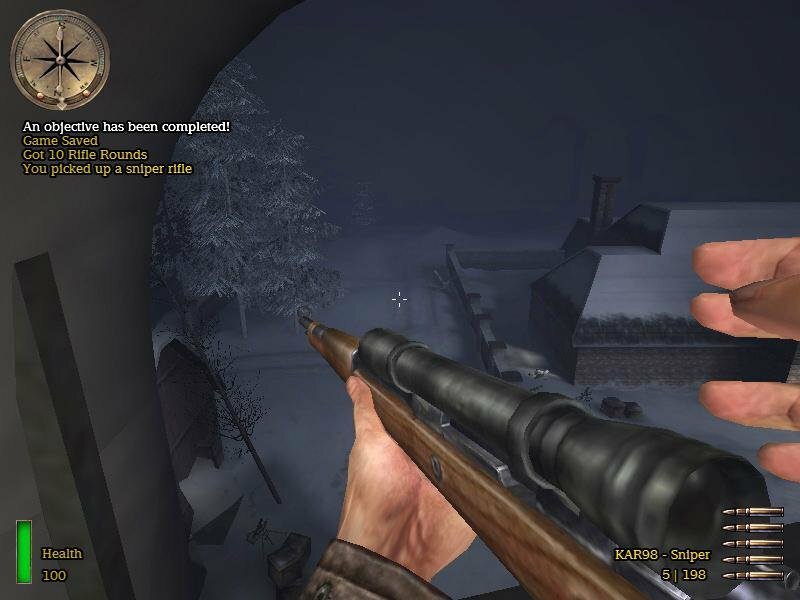 The singleplayer portion will almost always have friendly soldiers tagging along with you, including a huge assault on a German town. 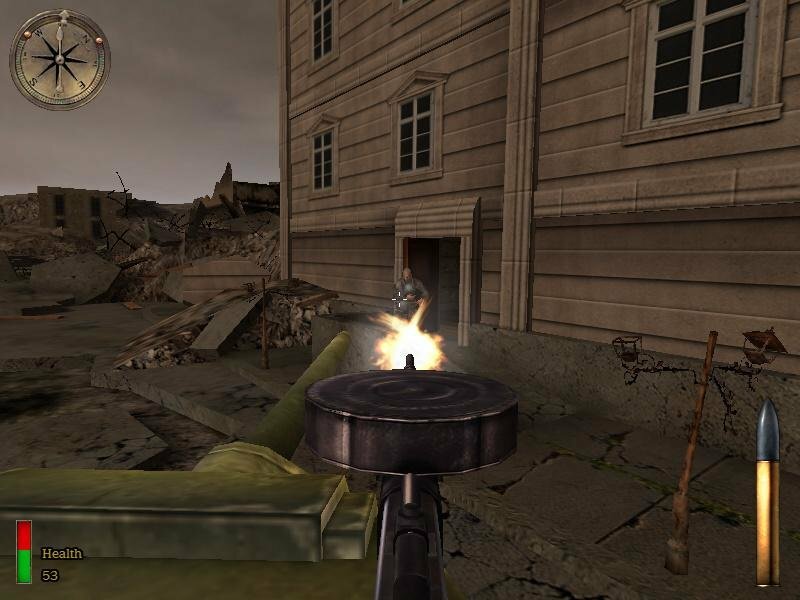 As before, the AI can handle itself fairly well in a team, and you’ll hardly even notice their presence in a heated firefight. In the end, Spearhead is a high quality expansion pack with few loose ends but one that’s still worth a look, but don’t be surprised if you wrap it up in one weekend. May I know why the magnet links don’t work with my uTorrent 2.2.1 ? Is there any specific version range required ?